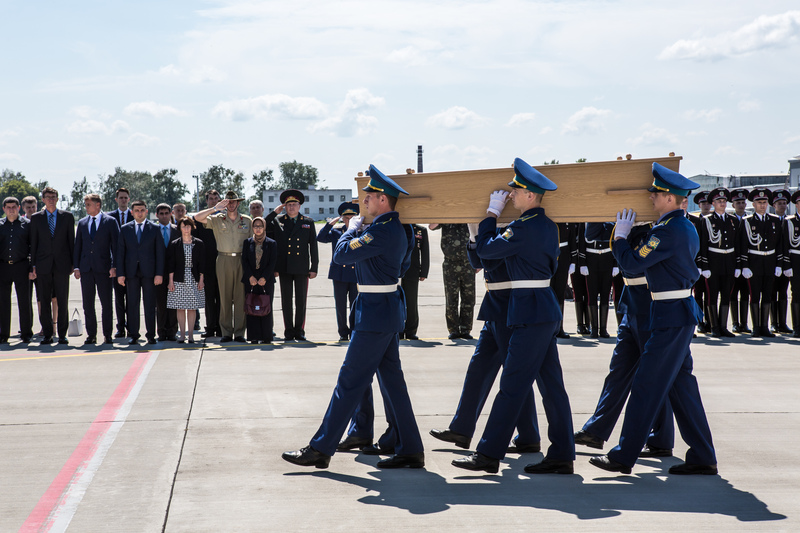 Following days of confusion and resistance, two military aircrafts carrying the bodies of Malaysia Airlines Flight 17 victims left Ukraine on Wednesday. The military transport planes are en route to the Netherlands, the homeland for a majority of the victims. These will be the first bodies of the MH17 passengers to arrive in their native country, bringing a sense of closure to the grieving families who await them. In honor of the return of the bodies, the Dutch government declared Wednesday a national day of mourning. Dutch Prime Minister Mark Rutte has ordered government buildings to fly their flags at half-staff; Dutch buildings and complexes overseas were instructed to do the same. Rutte, along with Dutch King Willem-Alexander, Queen Maxima and relatives of the victims, will meet the planes when they arrive at the air force base in Eindhoven. The Dutch government said a bugle will be sounded when the planes arrive in Eindhoven. A moment of silence will be observed nationwide for one minute. Church bells will also ring for five minutes. The exact number of coffins on the planes have yet to be confirmed. According to BBC News, 40 coffins were loaded onto the two planes at Kharkiv Airport in the northeastern region of the Ukraine. Meanwhile, the Associated Press reported that the Dutch government expected about 60 coffins. A ceremony was held at the airport to send off the bodies. Once the bodies arrive in Eindhoven, they will be taken to the Korporaal van Oudheusden barracks for identification. "Once a positive identification has been made, the immediate next step will be to inform the next of kin. No one else," Rutte said in a statement on Tuesday. "This may happen rapidly, but I have to caution you that it could also take weeks or even months." The Dutch government has been ordered to lead the investigation of the downing of Malaysia Airlines Flight 17, at the request of the Ukrainian government. Rutte said the investigation will be the country's next priority. "We will leave no stone unturned," he said. The next step for the government is to find remaining victims and personal belongings, as well as ensuring direct access to the crash site, Rutte added. An international, independent investigation of the disaster is essential in order to obtain a clear picture of the facts. I would like to reiterate that we must ensure that prematurely finger-pointing does not cause access to the disaster site to be restricted, thus reducing the chances of recovering the victims' remains, returning them to the Netherlands and carrying out an independent investigation. I understand that many people want us to be clear and to identify the guilty parties as quickly as possible, but I would point out the dilemma involved here. Several U.S. officials briefed the media on Tuesday, saying MH17 was likely shot down by the pro-Russia separatists using an SA-11 antiaircraft missile, but the direct involvement of Russia is still unconfirmed. However, this hasn't reduced the simmering political tensions between Russia and the Western world, as intelligence officials continued to blame the Kremlin for "creating the conditions" for the strike and ensuing crash of MH17.